The Constraint Processing Lab, at the University of Regina, is a centre for research on the theoretical and practical aspects of constraint solving and optimization. This Lab is funded by NSERC Discovery and Engage Grants. The lab is located in Room 308.19 of the College West Building and Room 129.9 in the Classroom Building. Mahdi Bidar, PhD (from Sept. 2016). Evolutionary Computation for Constrained Optimization Problems. Eisa Alanazi, PhD (from Jan. 2013). Preference-based Constrained Optimization under Change and Uncertainty. 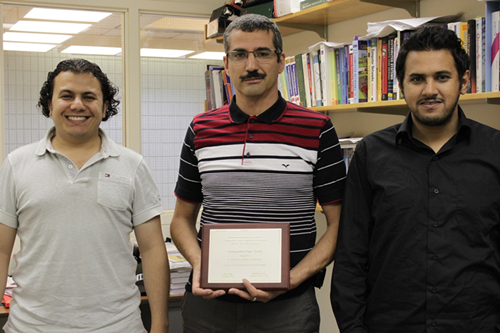 Ahmad Nesir Zghoul , PhD (from Sept. 2012). Constraint Optimization. Bandar Mohammed, PhD (from Jan 2012). Qualitative and Quantitative Preference Elicitation and Learning. (Co-supervision). Ahsan Waqar. PhD (from September 2009). Managing Combinatorial Queries with Preferences. Hamad Al Marri, MSc (from May 2016). Learning Constraint Networks. Massoud Ahmadi, MSc (from Sept. 2016). Support Vector Machines for Constrained Optimization. Munira Al-Ageili. PhD (January 2009 - December 2014). Integrating Ontology-Based Information Extraction Systems and Spatial Modeling for Land Use Analysis and Simulation. Ali Hmer. PhD (September 2007 - April 2013). A Parallel Hybrid Metaheuristic Approach for Timetabling. Amrudee Sukpan. PhD (September 2002 - July 2008). Conditional and Composite (Temporal) Constraint Satisfaction Problems. Xuegang Wang, MSc (September 2014 - April 2016). A Dynamic Stage-Based Fraud Monitoring Framework For Multiple Live Auctions. (Co-supervision). Yong Ket Wei, MSc (May 2014 - January 2016). Using Conflict and Support Counts for Variable and Value Ordering in CSPs. Shu (Jessie) Zhang, MSc (September 2012 - Nov. 2014). Managing Constraints and Preferences: Constrained Tradeoffs-Enhanced Conditional Preference Networks (CTCP-NETS). (Cosupervision). Ahmed Mobaraki, MSc (May 2011 - Dec. 2013). A CSP Solver using GPUs. Reza Abbasian, MSc (September 2010 - April 2012). A Hierarchical Parallel GA Based Approach for Constraint Problems. Bandar Mohammed, MSc (September 2009 - Dec. 2011). Managing Constraints and Preferences in Interactive Applications. Eisa Alanazi, MSc (May 2009 - September 2011). Managing Constraints with Preferences and Uncertainty. Farnaz Ghavamifar. MSc (Jan. 2008 - Oct. 2010). A Novel Trustful Multi-Attribute Reverse Auction (Co-supervision). Bahareh Jafari. MSc (September 2007 - March 2010). Using Non-Systematic Algorithms for Variable and Value Ordering in CSPs. Nurul Anwar. MSc (September 2003 - July 2008). Aspect Oriented Programming (AOP) for Common Services. Rasem Rashid. MSc (September 2004 - June 2008). Solving the Professor to Class Assignment Problem using CSPs. Roger Barbour. MSc (Jan. 2006 - April 2008). Reduction of Complexity in Path Finding Using Grid Based Methods. Jia Liu. MSc (September 2005 - March 2008). Managing Temporal Constraints with Uncertainty. Chang Feng. MSc (September 2005 - Dec 2007). Solving Combinatorial Queries in Relational Database (Co-supervision). Colin Witow. MSc (September 2004 - October 2006). Multiple Robot Collaboration. Xiao Feng Li. MSc (September 2004 - October 2006). A UML-Based Solver Tool for Combinatorial Problems (Co-supervision). Xinkai Feng. MSc (September 2003 - July 2005). A Study of Branch and Bound for Incremental Satisfiability Problem. Chonghai Wang. MSc (September 2003 - July 2005). A Study of Approximation Techniques for Incremental SAT and MAX-SAT.